“It is possible for Kosovars to be involved in very big companies in Canada and the United States. When you have a laptop and an internet connection, you can work for clients to m ake billions of revenue.” This is not only the opinion of Ermal Sadiku, CEO of LinkPlus IT, but also his own experience. Right now, twenty people are working in the office, located in Pristina, Kosovo. 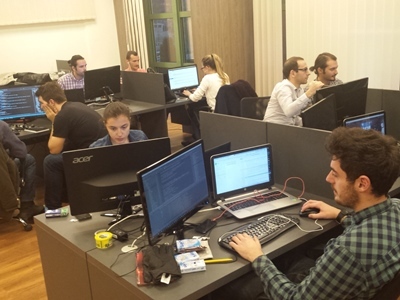 Five employees work in another office in Skopje, Macedonia. But things have changed, and not only in Kosovo. Sadiku: “The global community is moving towards outsourcing. Years ago, you did not have much contact with your client during your time of the project. After a couple of weeks, you showed the results. Nowadays, my employees have a daily contact moment with their client. This makes the chance on failing a project much smaller.